Craig’s book introduces itself like an exciting vacation destination. From its exotic cover to the medieval illustrations inside, “Living the Hero’s Journey” offers an enticing theme for us to consider. There are options to face demons, seek treasure and share the profits of discovery with the world. What is most special about Craig’s book is the imagery and the metaphors that he uses throughout to describe this quest to self-discovery. The author’s experience in film and television is strongly reflected in his work. He references ancient myths and folklore with connections to modern day heroes that are entertaining and relatable. Many of the examples Craig provides stem from the research of Joseph Campbell who affected storytellers such as George Lucas and some of the Disney screenwriters. Their contemporary characters are heroes encouraged to receive the call, encounter adversity and obtain the reward that will transform and make the world a better place. This is also the journey the author summons each of his readers to make. With our moral compass and the map of self-discovery in hand, we are requested to embark on an inner journey that can lead to significant growth and meaning. There is great philosophy to be had in Will Craig’s writings. 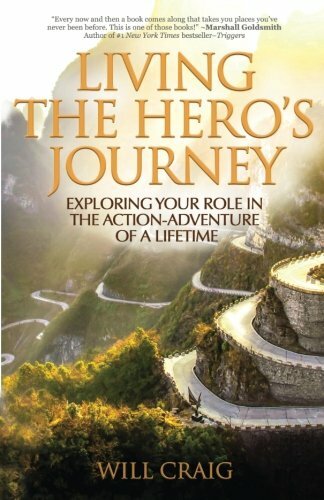 “Living the Hero’s Journey: Exploring Your Role in the Action-Adventure of a Lifetime” reads like a college text filled with profound segments of knowledge that deserve to be highlighted in yellow. Craig’s general intent is for his reader to seek authenticity in life - something from which we can all benefit. His book reflects on principles that can point you in the direction of who you really are and why you are here with the ultimate goal being to discover your own uniqueness so that it may be shared with others. Much like the circle of life, Craig’s book suggests that we contribute to society’s greatness by finding our own place in the world.